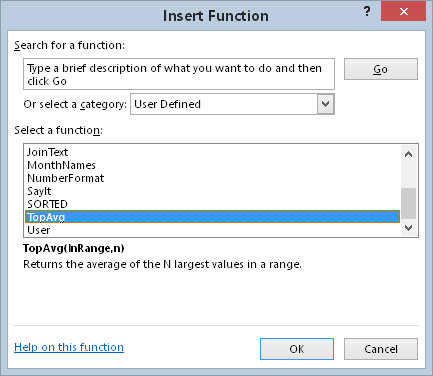 The Insert Function dialog box is a handy Excel tool that lets you choose a VBA worksheet function from a list and prompts you for the function’s arguments. Your custom worksheet functions also appear in the Insert Function dialog box. Custom functions appear in the User Defined category. Function procedures defined with the Private keyword do not appear in the Insert Function dialog box. Therefore, if you write a Function procedure that’s designed to be used only by other VBA procedures (but not in formulas), you should declare the function as Private. The Insert Function dialog box displays a description of each built-in function. But as you can see, a custom function displays the following text as its description: No help available. By default, the Insert Function dialog box does not provide a description for custom functions. Activate a worksheet in the workbook that contains the custom function. Choose Developer → Code → Macros (or press Alt+F8). The Macro dialog box appears. In the Macro Name field, type the function’s name. Note that the function does not appear in the list of macros; you must type the name. The Macro Options dialog box appears. 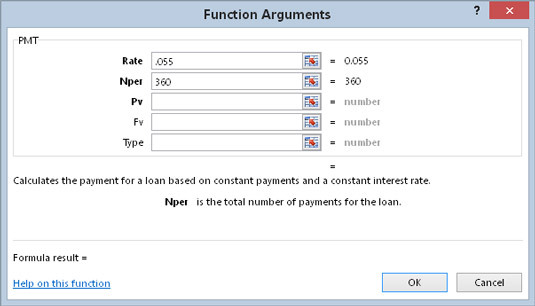 In the Description field, type a description of the function. Now the Insert Function dialog box displays the description of your function. The custom function now displays a description. Check the Help system for other category numbers. You need to execute this statement only one time. After you execute it (and save the workbook), the category number is permanently assigned to the function. When you access a built-in function from the Insert Function dialog box, the Function Arguments dialog box displays descriptions of the arguments. By default, the Function Arguments dialog box displays Function argument descriptions for built-in functions only. You need to execute this procedure only one time. After you execute it, the argument descriptions are stored in the workbook and are associated with the function. Notice that the argument descriptions appear as arguments for the Array function. You must use the Array function even if you’re assigning a description for a function that has only one argument.